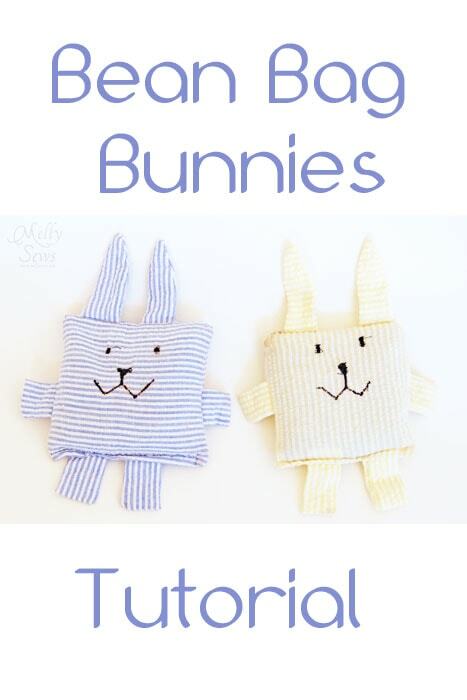 Today I’m going to show you how to sew Easter bunny bean bags. 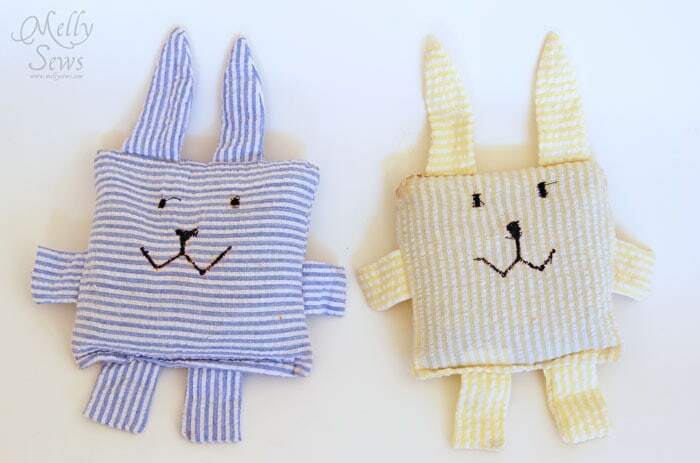 I actually made these cute guys last year (with seersucker left over from this project), but then I never blogged it. So here they are. Start by determining what size finished beanbag you want. Mine are 5″ square. 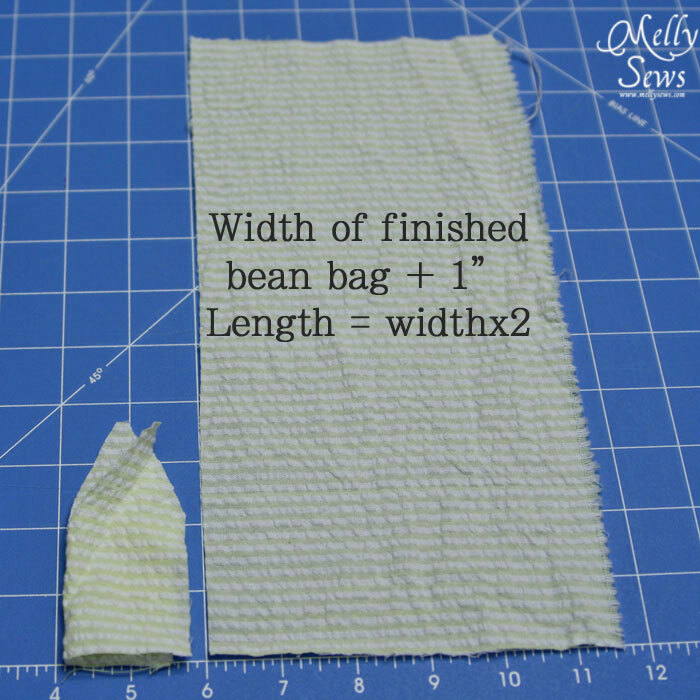 Cut a rectangle that is the width you want your finished bean bag to be + 1″ and twice as long as it is wide. So my cut piece was 6″ x 12″. I also cut out some ear shapes (4 per bunny), two small rectangles for arms and two for legs – make these wide enough to fold in half. 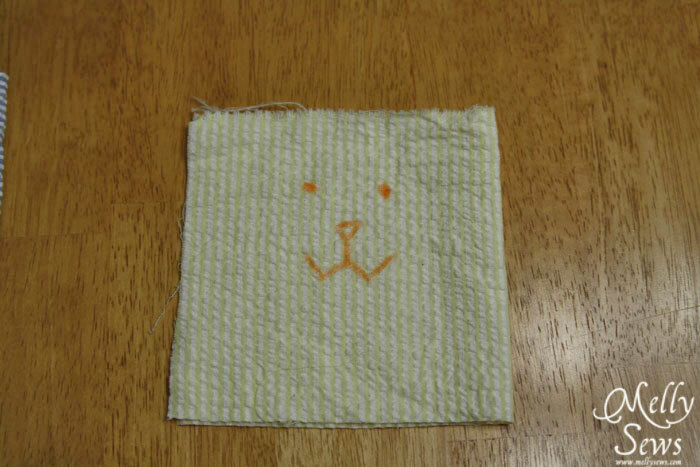 Next I drew a bunny face in the center of my folded fabric. I used a regular machine stitch and zig-zag to go over my drawing and embroider it. 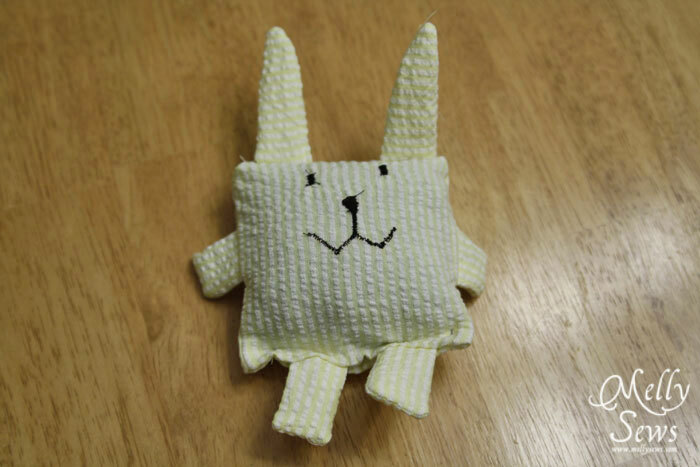 Sew your bunny ears and turn right side out, same for rectangles for arms & legs. Go ahead and cut your large rectangle in half. Pin arms/legs/ears to the edges of the bunny as shown below and baste in place. Place the other half of the rectangle on top of this one, right sides together, and stitch around 3 sides, leaving the leg side open. Turn right side out and stuff with beans, peas or lentils. 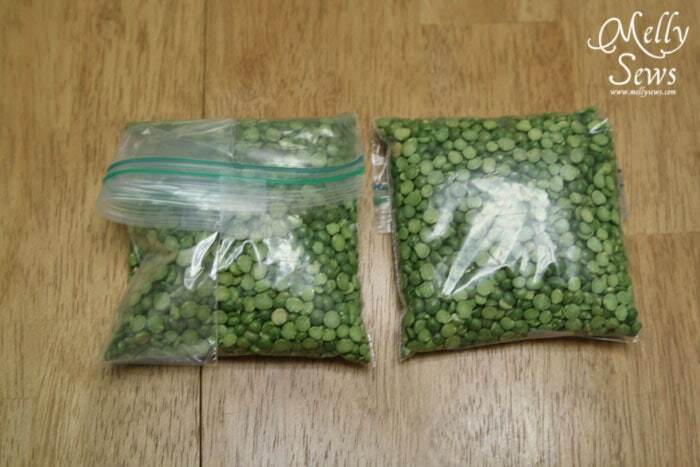 I used split peas reinforced in a ziploc bag (that I folded to the right size and taped) to withstand abuse from my boys. A year later and they still haven’t busted, so I call that good. 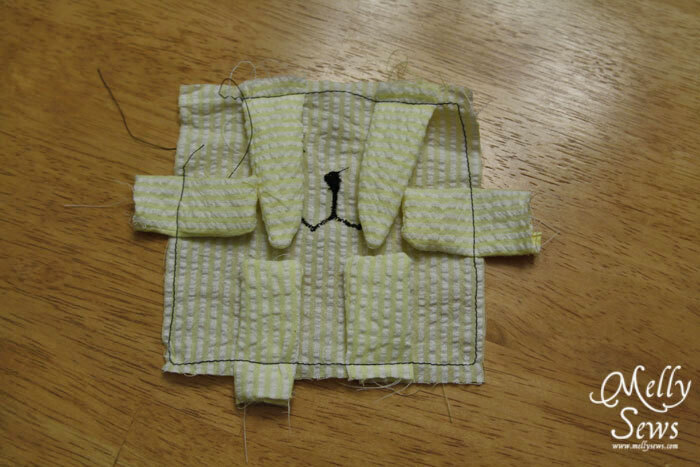 Fold the raw edges in across the bottom and stitch across. And stand back as your boys hurl bean bag bunnies at each other. Melissa, I’m pinning this to my ConKerr Pillowcase Project board on Pinterest. ConKerr volunteers throughout the world brighten the lives of children with life-threatening illnesses with a simple act of kindness: making a fun, cheerful pillowcase to brighten their day and demonstrate their makers’ love and concern. 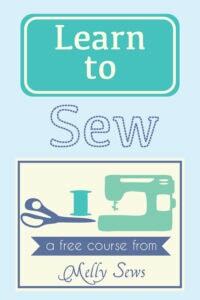 I’ve pledged to make one pillowcase a month for this effort (I”m up to 18! ), and hope it’s okay with you if I use your beanbag design as an, err, jumping off point (ha!) for a special bunny lover. Thanks so much for your cute inspiration. By the way, you can find more about ConKerr at http://www.conkerr.cancer.org. These have such friendly little faces! Nice job, Melissa! I have made alot of plain bean bags for my preschool classes. These are just so CUTE! I love these Easter Bunny bean bags. 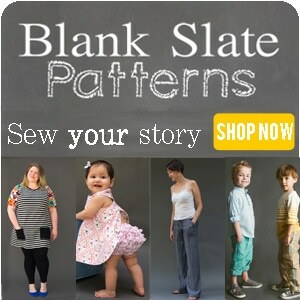 I’m featuring you on my blog, http://www.plushiepatterns.com.